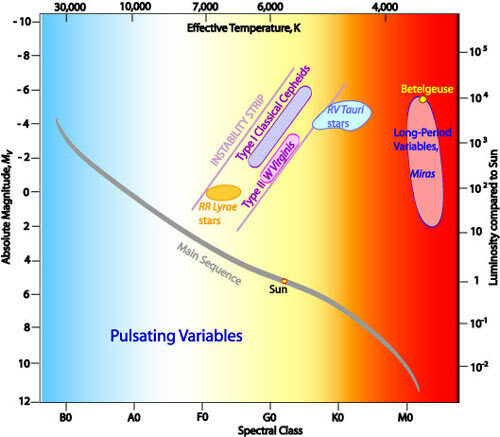 A pulsating variable is a type of variable star whose light output, surface temperature, and spectrum change because of a periodic expansion and contraction of the star's upper layers. If the pulsation is radial, it occurs symmetrically over the whole surface so that the star remains spherical. This is the case with most giant and supergiant pulsating variables, including Cepheid variables, RR Lyrae stars, RV Tauri stars, and Mira stars. If the pulsation is non-radial, as for example with ZZ Ceti stars, waves run in all directions over the star's surface giving rise to multiple periods and a complex patterns of nodes and antinodes.